The intention: finally make no-knead bread. The action: mess with the recipe to sate my craving for sweets. 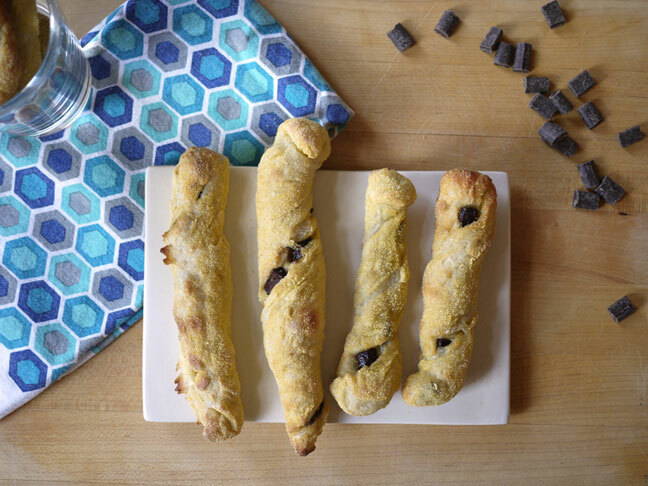 The result: CHOCOLATE CHUNK BREADSTICKS! That’s right, friends: I finally made no-knead bread! But, instead of sticking with the recipe, I decided to do a little experiment. I know, I know. You’re not supposed to mess with a good thing – and believe me that no-knead bread is pure genius – but you sure are happy that I did. After all, genius + chocolate = double genius, right? I barely adapted a recipe from the New York Times that was originally adapted from Jim Lahey of the famed Sullivan Street Bakery. All I did was add a little sugar and twist strips of the ready-to-bake dough with chocolate chunks. 2. 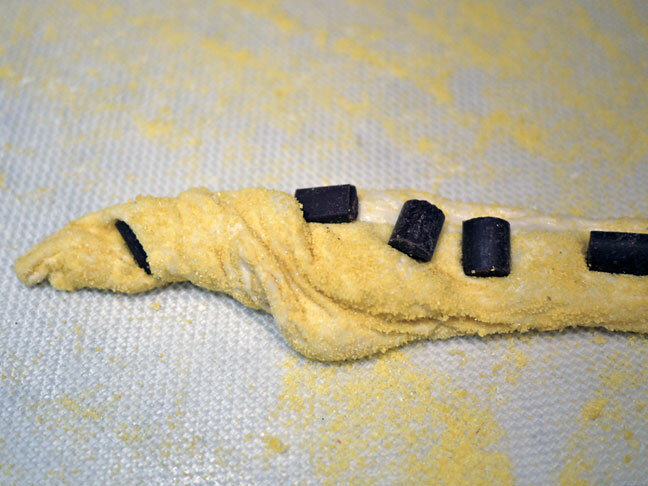 Turn the dough onto a lightly floured work surface. Dust the top of the dough with more flour and fold it over on itself 2 times. Leave the dough in place and cover loosely with plastic wrap. 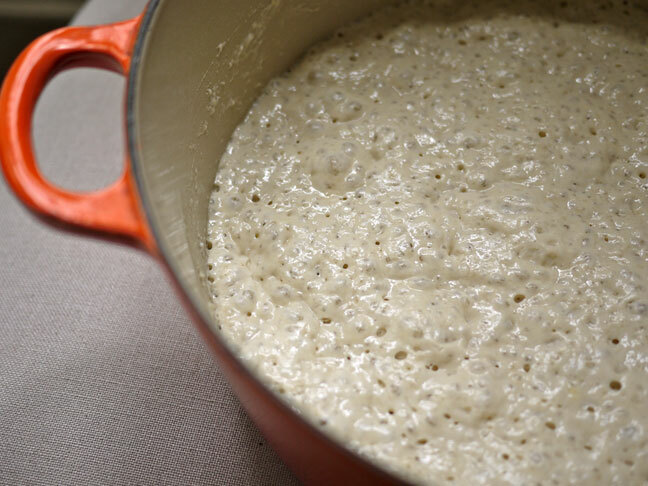 Allow the dough to rest for about 15 minutes. 4. Allow the dough to rise for 2 more hours. In this time, it should double in size and not immediately spring back when poked. 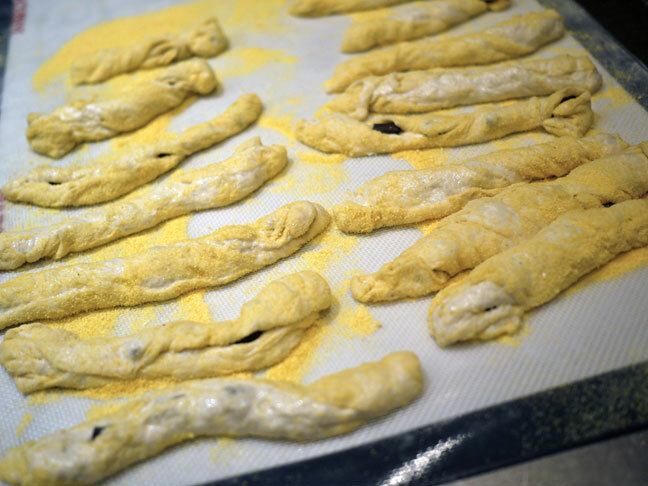 At least a ½ hour before the dough is ready, place 2 cookie sheets in the oven and heat to 230ºC. 5. When the dough is ready, carefully lift the towel and bring it to your work area. Keeping the dough under wraps, turn the covered loaf on its side, allowing the excess polenta to fall onto your work surface. 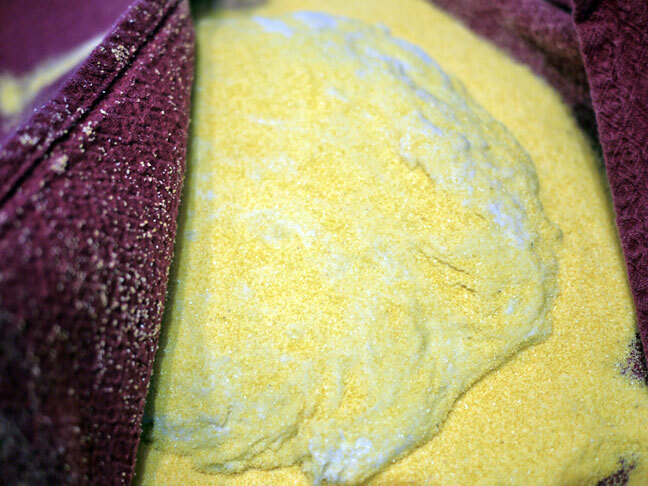 Then unwrap the dough and place it on top of the polenta. 7. Dot the top of each stick with chocolate chunks. I used packaged “chocolate chunks” that worked well and tasted great. But, to be honest, they were too neat looking. Next time I’ll break up a semisweet chocolate baking block into beautifully uneven chunks. Also, I feel like the bread to chocolate ratio of my breadsticks was a little off. You see this amount of chocolate? Add more! 8. 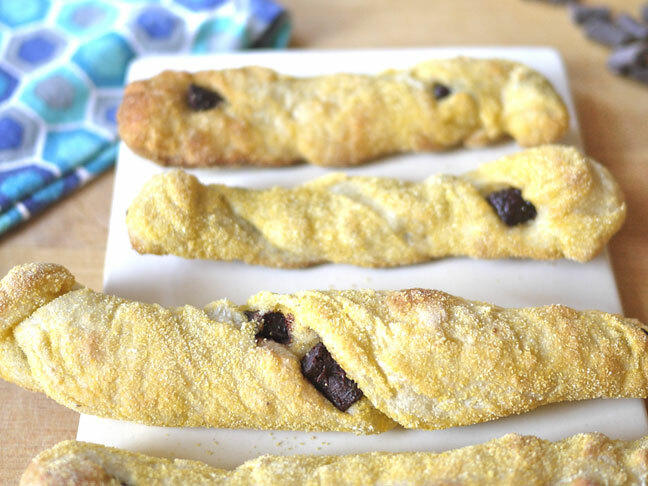 Starting at the end of each breadstick, twist the dough over each chocolate chunk until they are all embedded in the dough (see the left tip of the breadstick above; like that). Be sure to let some of the chocolate peek through, though! 9. When your oven is ready, carefully take out the hot baking sheets. Without touching them (ouch! ), place a piece of baking paper on each sheet. 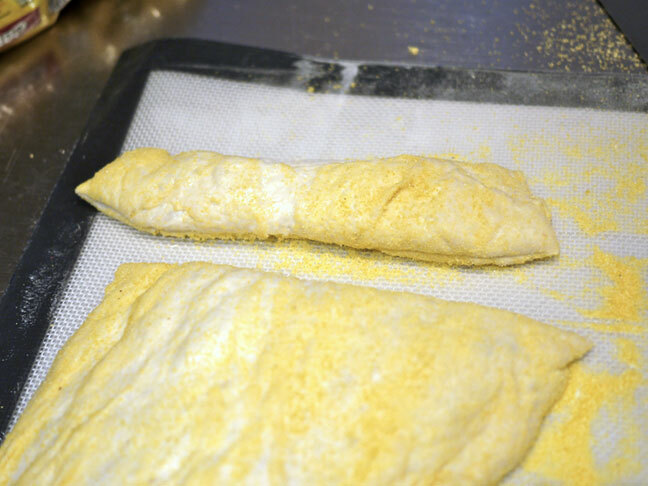 Place the prepared breadsticks on the sheets, about 5 cm apart and return to the oven. Bake for about 12 minutes, uncovered, until the visible chocolate is melty and the dough golden brown. 10. Carefully transfer sticks to a cooling rack and as soon as they are cool enough to eat, enjoy!!!! You can store these in a Ziploc bag over night but, just like with other fresh breads, these are best the day of.